where G is the gravitational constant, M is the mass of the body being orbited, and r is the distance to the center of that mass. 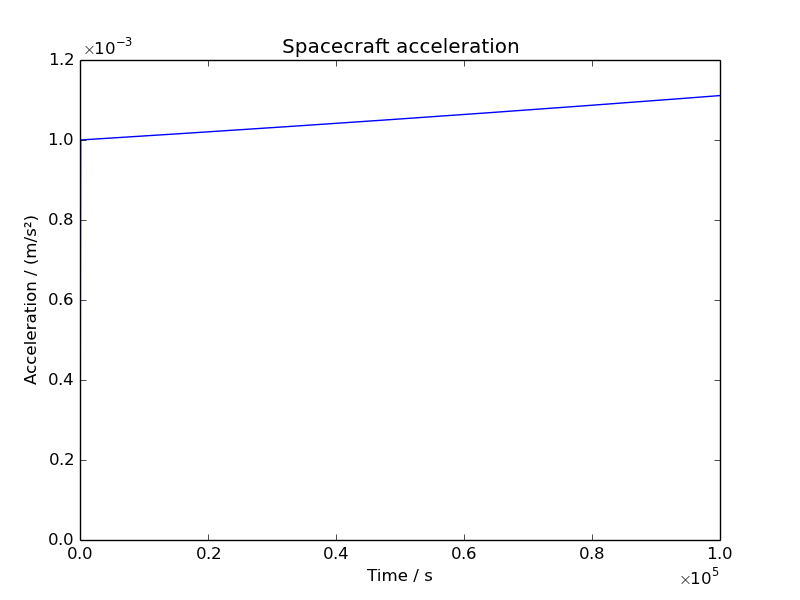 I tested this on the ISS’s orbit and found the velocity matched quite well. Now, I’m interested in looking at orbital periods, and calculating aspects of some common orbits. Problem: Calculate the velocity and periods for some typical circular orbits. See Part 1, where I looked at how increasing horizontal launch velocities could lead to orbit. Now I want to explore this mathematically. In the Feynman Lectures on Physics, Vol. I, Ch. 7, Section 7–4 “Newton’s law of gravitation,” Feynman looks at the velocity required to achieve (circular) orbit. He looks at how far a projectile would fall in one second, and then looks at how fast it would have to be traveling horizontally to clear the surface and maintain the same altitude. I’d like to expand on his approach and see if I can find a general expression for the velocity. Problem: Use the standard projectile motion equations to derive an expression for the velocity required to achieve circular orbit. In this thought experiment, a cannon at the top of a tall mountain fires a cannonball at increasing velocities, until eventually it moves so fast that it achieves orbit. Problem: Model a projectile being launched into orbit in this manner, and visually explore the transition between falling to Earth and orbiting. As I continue reading the Feynman Lectures on Physics, I’m intrigued by the discussion of the random walk in Chapter 6: “Probability,” Section 6–3: “The random walk.” Feynman discusses a random walk in one dimension, where at each step an object moves one unit either forward or backward at random. In Figure 6–5, he draws a graph tracing the distance moved over 30 steps, for 3 trials. I remember seeing graphs like this in my textbooks when I was in school, studying them and trying to appreciate them. And I realize that now technology has advanced so much that I can explore these further on my home computer. Problem: Graph a random walk in one dimension, following more trials over longer periods. Problem: Can I understand the kinetic energy formula, K=½mv², in a more intuitive manner? I’ve been wanting to systematically go through a physics text, refreshing my knowledge and filling in gaps. I found The Feynman Lectures on Physics, freely available online, based on lectures from the great physicist and physics popularizer, Richard Feynman. As I read Chapter 4: “Conservation of Energy,” I wonder if I can derive the formula for kinetic energy, the energy an object has due to its motion. My primary motivation is that while it is relatively easy for me to grasp why the gravitational potential energy is U=mgh (that is, weight times height), I have a much harder time intuitively understanding why the kinetic energy should be proportional to the velocity squared: K=½mv². Problem: Given the formula for gravitational potential energy, can I use the principle of conservation of energy (of a projectile) to derive the equation for its kinetic energy? See Part 1, where I introduced the problem. 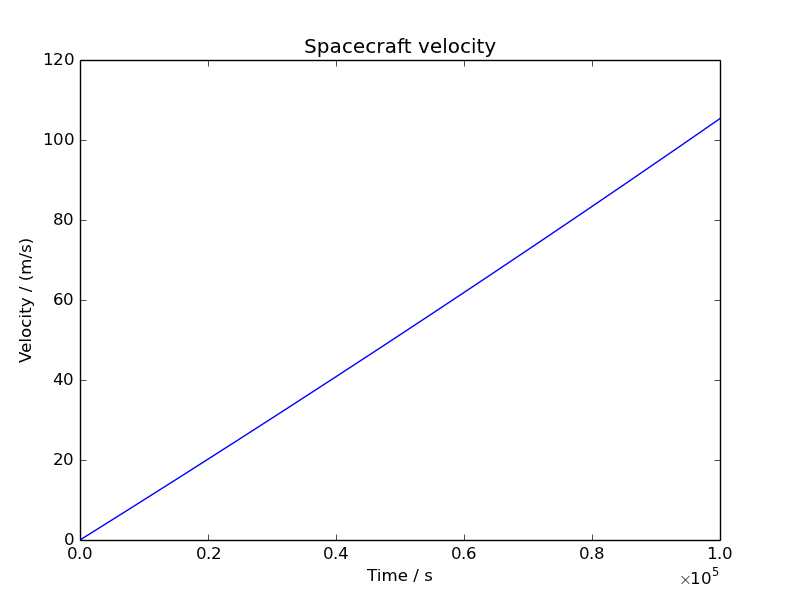 Constant acceleration of an object (such as a spacecraft) produces a linearly increasing velocity and therefore a quadratically increasing kinetic energy (since EK = ½mv²). If it took a constant energy supply to produce the constant acceleration, there would seem to be a mismatch between the amount of energy consumed for propulsion and the amount of kinetic energy gained. Momentum must be conserved, so for the craft to increase velocity forward, it must eject some mass backward. 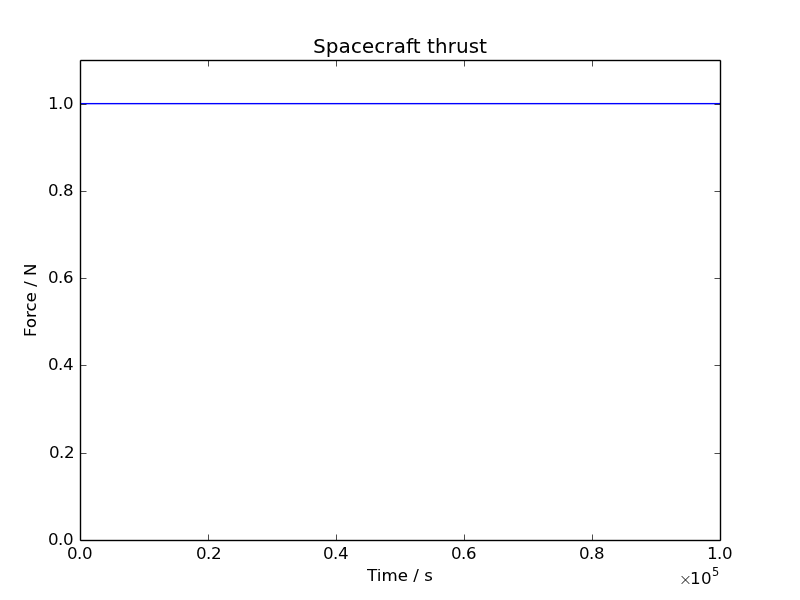 I explored this using the case of a thruster that ejected a small amount of mass per second, and it turns out that while the kinetic energy of the craft increases quadratically, there is far more kinetic energy given to the expelled propellant, and the total kinetic energy appeared to increase linearly, at least in a spreadsheet that evaluated the first 60 seconds. I would like to make this approach a little more rigorous. In particular, I assumed a drive that ejected a constant amount of mass each second, and looked at the behavior over the first minute. I am hoping that this approximates the continuous case, but I’ll want to verify this by using very small time intervals, if needed. And I also want to explore the behavior of the rocket over a much longer period of time. For this, I will need more than a spreadsheet — I will write a program in Python. Also, I assumed that the drive ejected the mass at a constant velocity relative to the craft. There is no guarantee that this will take the same amount of energy over time, since the mass of the craft changes. Let’s work it out more rigorously. 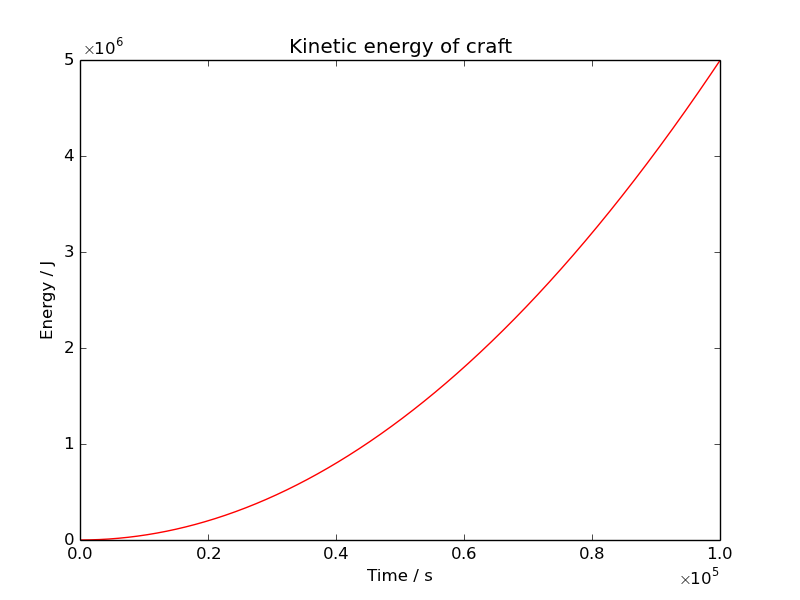 Kinetic energy (EK = ½mv²) is not conserved; we are adding an amount of energy E each time interval. I am specifying that the propellant is ejected in the negative direction (v2 < 0 ), so logically and by the momentum equation above, the craft will move in the positive direction (v1 > 0); therefore, we can discard the negative solution. This answer looks reasonable. Dividing energy by mass (m1), doubling, and taking the square root are just the inverses of the kinetic energy equation. The is the fraction of the original mass that was ejected. At last, I’m ready to code this into my program. The code will reevaluate the variables each timestep Δt. Given a predefined rate of propellant use (in mass/time), we know how much is used each interval: multiply the rate of propellant use by the timestep to get m2. We can subtract that from the ship’s prior mass to get its new mass, m1. We’ll use the velocity equation derived just above to derive its velocity increase (recall that I defined those equations in a reference frame where the craft was starting at rest), so we’ll add that to the craft’s prior velocity to get its new velocity. The energy E added each step is the predefined rate of energy production multiplied by the timestep. The drive will work for 100,000 s (which makes sense since we eject 1 g/s, and we started with a reaction mass of 100,000 g — 10% of 1,000,000 g), or 27.8 h. It will reach a velocity of 105 m/s (235 mph, 378 km/h). The acceleration looks constant. Is it? I’ll add in a line in the program to calculate the acceleration, by taking the new velocity minus the old velocity, and dividing by the timestep: a = (vf – vi) / Δt. Interesting. I actually thought the acceleration would be roughly constant over this period. It starts off with an acceleration of 1.00×10−3 m/s², and ends with an acceleration of 1.11×10−3 m/s². I assume that this rate of increase is because the craft is 10% lighter by the end, so a constant thrust will accelerate it more. We can calculate the force by taking the acceleration and multiplying by the mass at that time (F=m1a). As expected, it looks parabolic. Of course, the velocity is not increasing linearly, as we know the acceleration is actually increasing over time. But the mass is decreasing, too. It reaches a kinetic energy of 5.00 MJ (5.00×106 J). We already know that this must only be a small portion of the total kinetic energy. Let’s find the kinetic energy of the propellant. This is slightly more complex to code, since each at each time step we need to add in the (unchanging) kinetic energy of the new bit of propellant that’s been ejected, rather than looking at the changing velocity and mass of the craft at that instant. And I’ll track the sum of the two kinetic energies as well. I notice several interesting things about this graph. 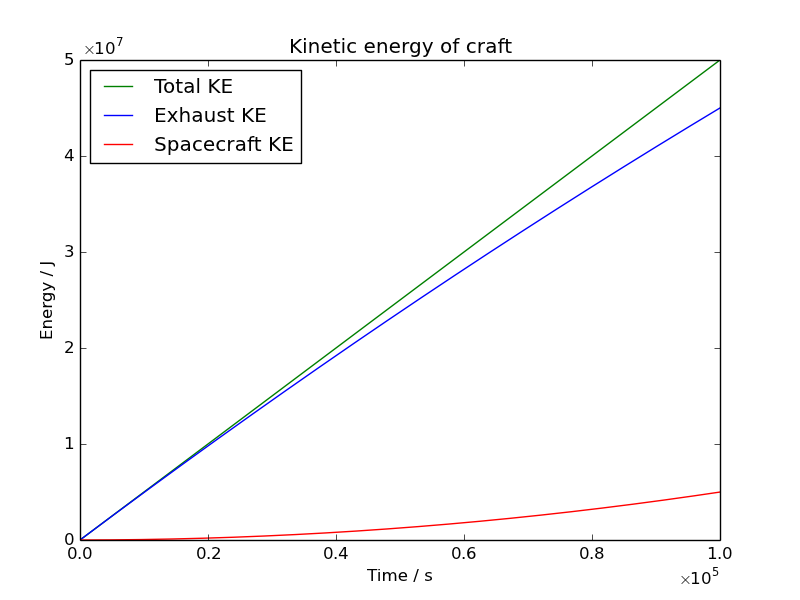 As expected, the kinetic energy of the exhaust is much more than the kinetic energy of the spacecraft (note the 10-fold increase in scale from the previous graph). The total kinetic energy does appear to be increasing linearly: the kinetic energy of the exhaust ends at 4.50×107 J, and after adding in the 0.500×107 J of spacecraft kinetic energy, we get a total of 5.00×107 J. In a way, this is a relief, because we’ve run our 500-W power source for 1.00×105 s, and multiplying the two gives 5.00×107 J. This gives me some confidence that the coding is correct. I also note that the kinetic energy of the exhaust increases, but that rate of increase slows over time (it curves away from the total line). Of course, this is to be expected, because the spacecraft’s kinetic energy is increasing at an increasing rate (and there is a fixed amount of total energy), but I’m still interested in understanding why this is happening. 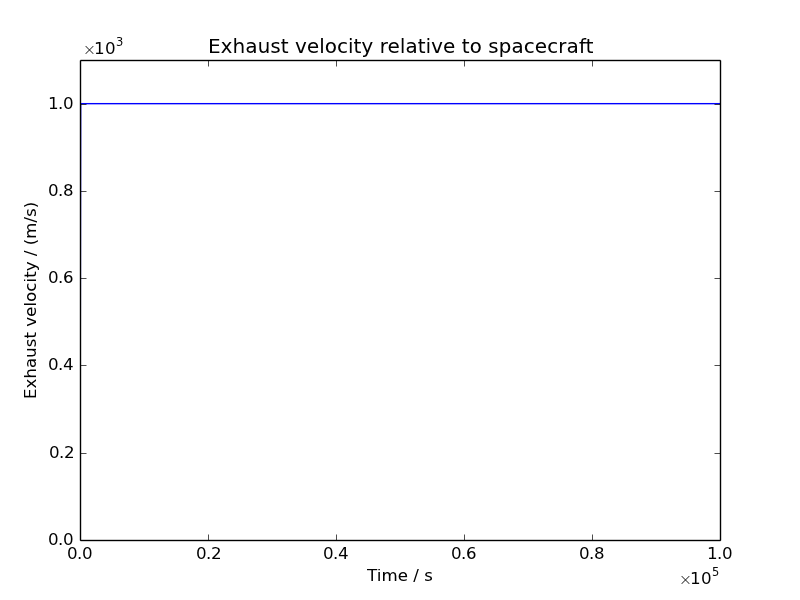 Let’s look at the exhaust velocity (v2 in our derivation above). If the spacecraft’s kinetic energy were truly parabolic, it would eventually cross any arbitrary line, including the line of total kinetic energy. Since this presumably can’t happen, I’ll want to explore what actually does occur — in the next post.